I wiped off the oil, warmed them up a bit in the microwave and sliced up a generous heaping of Marzano tomatoes and enjoyed these immensely for lunch. I can’t wait to buy them again – several tins of them, because, as you know, things go missing at Trader Joes all the time. By the way, I have eaten many dolmas, including the ones I’ve made, and these are great considering I didn’t have to go through the time-consuming and tedious task of rolling up grape leaves. I’d recommend to Eastern Europeans and anybody else with a paper towel, microwave, and a couple tomatoes. I appreciate your post, i was having doubts from other negative reviews. Since I bought the tin, I was determined to try them, and you have given me the ‘courage’ to do so. The tomatoes sound like a delicious addition. Thanks for the inspiration! It opens from the bottom so the seasonings and flavor aren’t trapped at the bottom when you open the can. The soybean oil is a downfall, but the flavor was surprisingly good. 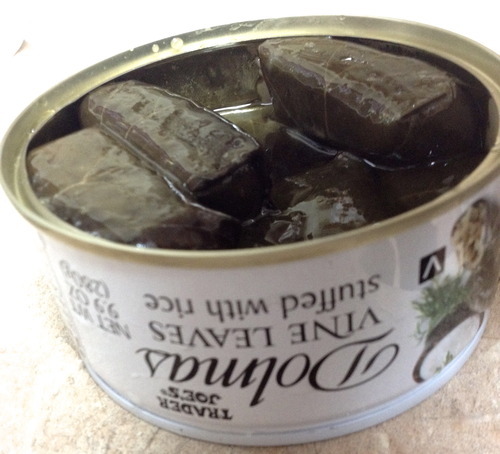 Anyone knows how Mediterranean food is rightly slathered in olive oil, which is what I did after fishing the dolmas out of the can. You clearly don’t have much prior experience with dolmas, and don’t like eating anything out of a can, including sardines which are the best power food ever. I’m glad someone has an answer for why they open upside down! But if they make the bottom the top, doesn’t the top just become the new bottom? At any rate, I’m curious to hear more about the powerful virtues of sardines. Preach on! Well I was thinking that they opened from the bottom to reverse the time spent on the shelf, to put the flavors on top. But this next time I opened the can, after draining it I emptied the whole thing into a bowl, and the dolmas fell out neatly. So maybe they’re meant to be “presentation-ready”, like the way a cake comes undone from a spring-form pan. As for sardines, to paraphrase Wild Planet brand, ounce for ounce sardines have more protein than steak, as much calcium as milk, more iron than spinach. It’s a good source of omega-3 fats, which are anti-inflammatory to the body and have a lot of important functions. TJ’s Dolmas aka Stuffed Grape Leaves are terrible. After reading ur product itinerary I see that TJ’s does not make them. You probably buy them from some low scale meditterean store. TJ’s should really take this product off their shelves. Dolmas are suppose to have rice, parsley, onions, peppers and loads of lemons. The only positive thing I can say about ur Dolmas is the leaf is very tender. I would love to know where your supplier purchases their grape leaves. I use to have my own vines, but since I moved to S. Jersey I no longer have access to fresh grape leaves. I refuse to waste my energy making the stuffing because all the bottled grapeleaves are very very tough, even if I par boil them they are awful. Let me know where I can purchase a good brand; I have tried all the bottled leaves and they are bad leaves. First, they were canned in Greece, not Turkey. Indeed, TJ’s used to have Turkish-made stuffed grape leaves that were in olive oil. They were about the same price, but fewer, and were in this really pretty multicornered glass jar sold over by the pickles. I bought lots. They were discontinued some years ago. As other commenters have noted, you don’t appear to have much experience with dolmas or stuffed grape leaves, otherwise you wouldn’t have defined them as you did (stuffed with rice only) or be surprised at the oil. The problem is it’s not olive oil, but it should be. They should still be drained or blotted if you are concerned. I found the flavor surprising good for a version that was not freshly made. Making your own stuffed grape leaves (which I’ve done, Lebanese style) is great, but incredibly time consuming. I bought several of the TJ cans to keep at work for a quick lunch. While I have decided I don’t like TJ’s frozen falafel (also tried for the first time this week), the grape leaves are going to become a staple for times I don’t have hours to dice (rock) and roll. Leila – Agreed – I used to make them with my lebanese family, too. And yea – what’s with the lower then sub-par falafel balls? So NOT TJ’s-like. Am I the only one who can’t open a can of these without breaking the little tab? Every single can I try to open, I end up having to open by using a butter knife as a lever to open the rest of the top! I had these recently and they are better than most of the canned dolmas I have tried over the years, but nothing beats the fresh dolmas TJs sold back in the 90s. They came in a plastic tray and had a little more of a tomatoey flavor in their filling I miss those. In my Glendale, CA store they told me that Trader Joe’s Dolmas no longer will be available, it’s discontinued. It is very sad, because we just discovered that great and delicious Dolmas at Tradet Joe’s. Now we wil be looking that product in other stores. I like to drain the oil off and squeeze a fresh lemon over them. Not the same as homemade but great for a quick fix! I enjoyed them a great deal and thought they tasted delicious. To each his own I suppose. I’m middle eastern and I loved them. same! this article is too harsh. Your taste buds are up your hole.